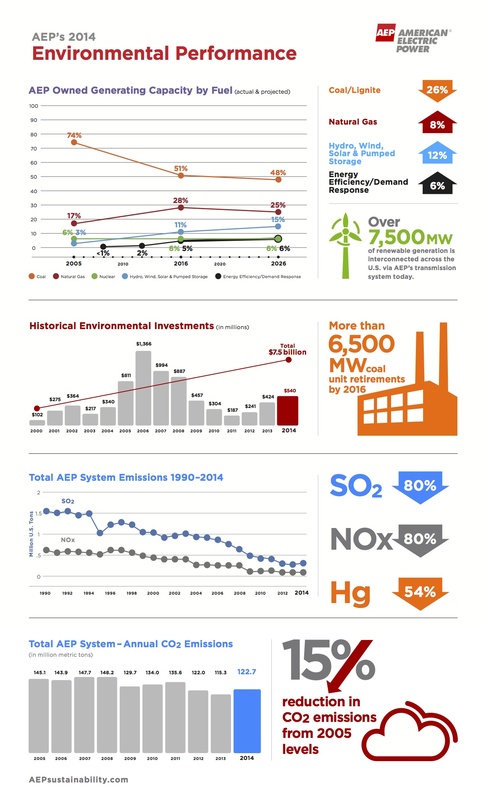 AEP’s 2014 Environmental Performance Summary highlights the diversification of AEP’s power generation portfolio along with investments in environmental controls that have resulted in environmental benefits. Since 2005, AEP’s carbon emissions have gone down 15 percent while sulfur dioxide (SO2), nitrogen oxide (NOx) and mercury emissions also have decreased significantly. Emissions from AEP’s power plants will continue to decline as the company retires additional coal-fueled generating units and further diversifies its fuel portfolio. By the end of 2016, AEP will retire more than 6,500 megawatts (MW) of coal-fueled generating capacity to comply with new environmental regulations and respond to weak electricity demand growth, aging infrastructure and continued competition from natural gas and renewables. Investment of more than $7.5 billion in environmental controls (2000-2014). For more information, view the AEP 2015 Corporate Accountability Report online http://aepsustainability.com/ or download the app in the iTunes store.